To help ensure better tasting water throughout your whole home, a chlorine filter is installed at the main waterline. Dechlorination can also reduce damage to appliances and fixtures from chlorine, while alleviating the effects of chlorine on your skin and hair. Considering a water purification solution that you can enjoy throughout your entire house? Watch to learn why a Reliance Whole Home Chlorine Filter may be the right choice for great tasting, purer water for you and your family. Our Dual Tank Iron Filter System installed at the main water line is excellent at removing high levels of iron from all the water used in your home. This is the ideal solution to help eliminate the metallic taste in your drinking water and foods cooked/washed in water, and to help avoid yellow, brown or rusty stains on your plumbing fixtures, sinks, water-consuming appliances and laundry. Installed at the main water line, our Iron Filter can effectively remove iron, manganese and hydrogen sulfide from all the water used in your home. If you’re experiencing foul-smelling (rotten egg/burnt match) water or dark stains on fixtures and pipes, an Iron Filter is a must. This filtration system also helps avoid yellow, brown or rusty stains on your plumbing fixtures, sinks, water-consuming appliances and clothing. Does your water have a yellow tint, metallic taste or have an unpleasant rotten egg smell? Watch this video to learn more about how an Iron filter may be able to help. RelianceTM rental customers can save $5 per month off the rental of select Water Softeners and Water Filters. Fill out the form today to schedule your free in-home water assessment! * Pricing only available in Ontario and the greater Winnipeg, Regina, Saskatoon, Calgary and Edmonton areas. 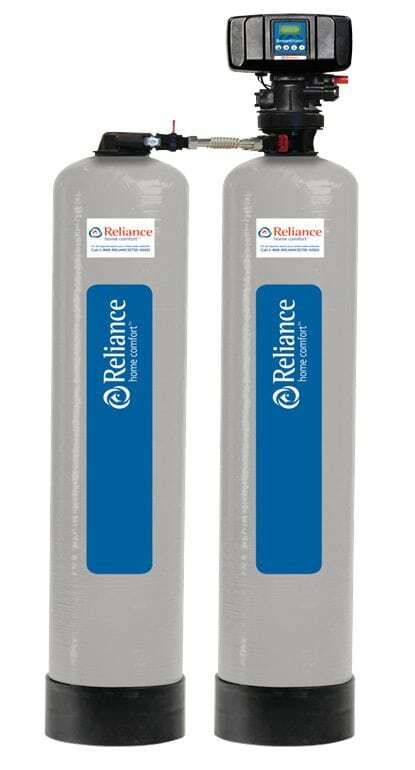 Monthly rental payment for the Reliance Whole Home Chlorine Filter is $29.99 plus applicable taxes and $34.99 for Reliance Iron Filter (13.59% APR in Ontario). APR varies by province from 11.66% to 19.34%. No charge standard installation. Subject to terms and conditions. Subject to availability, not available in all areas. ** Existing Reliance rental or protection plan customers are entitled to a $5 rate discount for so long as they maintain their existing rental or protection plan service in good standing.